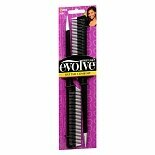 Shop Firstline Evolve Rat Tail Comb Set (2 ea. )2 ea. 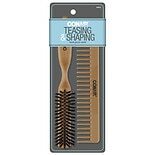 Detangle, smooth and style with brush and comb sets available here at Walgreens.com. Many of these hair accessory sets come with one hair brush and one comb, while others include two different brushes in different sizes or materials. 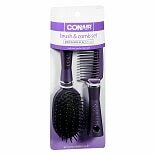 Choose the brush and comb set that can help you achieve the look you want, from those made for teasing and volumizing to all-purpose hair brushes and anti-frizz hair brushes. 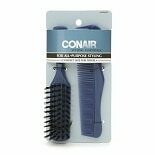 Trusted hair accessory brands Conair and Vidal Sassoon are here to help make hair styling a breeze. After detangling and styling with a brush and comb set, choose the styling product that can help you get the look you desire, whether it's texturized with a hair paste or sleek and smooth with a pomade. There are hair gels, hair sprays and mousse available in different levels of hold and scents. 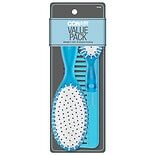 You'll also find blow dryers, curling irons, straighteners and more right here at Walgreens.com to help you achieve your ideal look.